I’ll admit, the first time I read this recipe I was doubtful. 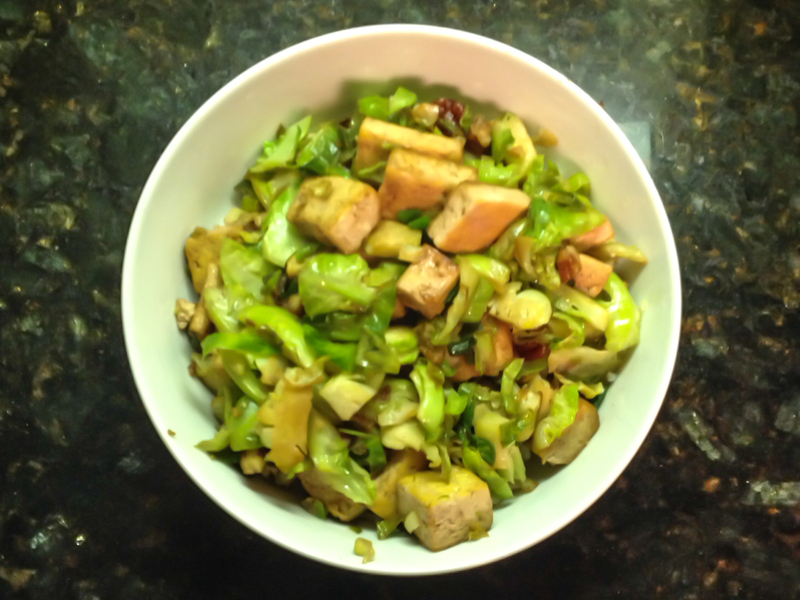 In my Own “Flavor Bible” that I’ve developed over the years, I never imagined that Brussels sprouts would pair well with tofu. Roasted with olive oil and bacon? Definitely. Pan fried with Parmesan cheese? Delicious. But stir fried with soy and Asian flavors? That seemed unlikely. Enter the shredded Brussels sprout. These sprouts are sliced thinly and stir fried, replacing the typical halved-and-roasted sprout that makes a seasonal appearance on household menus everywhere. Furthermore, these sprouts retain their crunch throughout the cooking process, behaving like green or red cabbage when put over high heat. To shred the sprouts by hand, cut the bottom off the sprouts and slice them in half lengthwise. With the cut side down, chop the halves into thin strips. Most sprouts, especially the leafier ones, will shred easily. 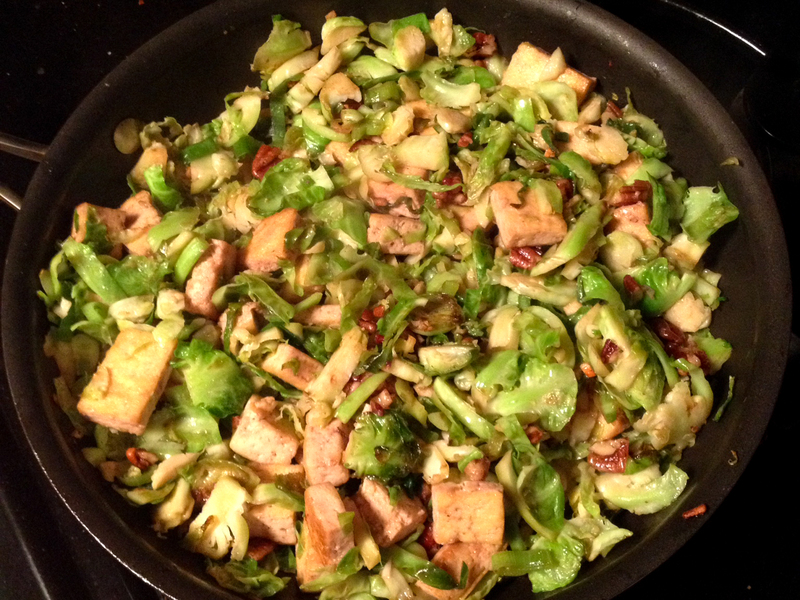 To cook, stir fry the sprouts in hot oil for 3-5 minutes, until leaves appear charred and tender. Toss the Brussels sprouts with some garlic, soy sauce, and caramelized tofu for a quick dinner that’s both sweet and salty – a combination that’s bound to satisfy everyone at the table. Heat oil in a medium skillet over medium heat. Add the tofu cubes and stir fry until golden, 2-3 minutes on each side. Add the garlic and nuts and stir fry for another minute or so. Reduce the heat slightly and gently add in the brown sugar, stirring quickly for 30 seconds to ensure that the sugar doesn’t burn. Remove tofu mixture from the pan to rest. Add shredded Brussels sprouts to the pan. Salt lightly and cook until slightly softened and charred, about 3 minutes. Stir in the green onions and soy sauce and stir fry for another 30 seconds. Add tofu mixture back to the pan to combine flavors. Let cool slightly and serve over brown rice.